The neighborhood of Orchard Knob has been known as a desirable place for low cost real estate and families with children. Living in the suburbs of Atlanta means having the chance to stay in a quiet, charming area, but still having the opportunity to enjoy pockets of city life when necessary. At less than 3,000 residents, Orchard Knob provides a tight-knit community and low-cost properties for all. The real estate within Orchard Knob area is certainly at a lower price point compared to other areas of the city, which makes it a great neighborhood for new families or couples who are planning for families down the road. The costs for single family houses ranges from a 3 bedroom, 2-bathroom house for $119,000 to a 4-bedroom, 2-bathroom single-family home for $145,000. Home ownership in Orchard Knob is less in terms of percentage versus owners, with only 30 percent of residents owning their homes. Renting an apartment in Orchard Knob is not as common as one might think, as there are few, if any, apartment buildings in the area. In fact, rather than finding cheap studio apartments in the neighborhood, residents will likely find upscale communities with townhouses and condos with for rent by owner properties available. Additionally, renting a house in Orchard Knob is more common, with rental prices around $1000 a month. Desirability within the Orchard Knob community stems from being so close to the Hartsfield-Jackson Atlanta International Airport. Just a mere 3 miles away, residents of Orchard Knob will be closer than ever to one of the busiest airports in the world. This makes the neighborhood desirable for both professionals who travel often and families with kids and retirees. 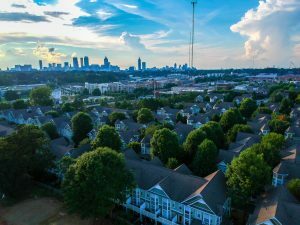 Not only is being near the perimeter of the airport such an important factor for prospective renters and homeowners, but also the close proximity to Downtown Atlanta. The distance from Orchard Knob to city center is around seven miles, which means the opportunity to live on a quiet property but still find rewarding jobs downtown is more than possible. For many people, choosing the right real estate involves knowing what is within the surrounding areas. Despite the close proximity to both the Hartsfield-Jackson Atlanta International Airport and Downtown Atlanta, there is still enough distance from both for Orchard Knob to be considered an enjoyable suburb. In fact, one of the reasons why Orchard Knob is so ideal for families is because of the abundance of green space nearby. Most potential residents thinking about living in Atlanta would not expect to find much greenery, however, right next to Orchard Knob is the natural beauty of Lake Charlotte Nature Preserve. Additionally, within the community is another area of green known as Empire Park. For potential residents considering the suburbia versus living closer to the Beltline, investing in a personal vehicle is a wise idea. Orchard Knob is known as a car-dependent neighborhood, with a low walking score of 23 out of 100. Having such a low walk score means that nearly all errands and opportunities to commute will require a car. While there opportunities for public transportation within the neighborhood, the transit score still remains at only a 42 out of 100. Those who wish to consider biking through the community will find a mostly flat terrain with a decent amount of bike lanes throughout.